Help for Personal Injury, Family Law, Real Estate, Estate Planning, and more! 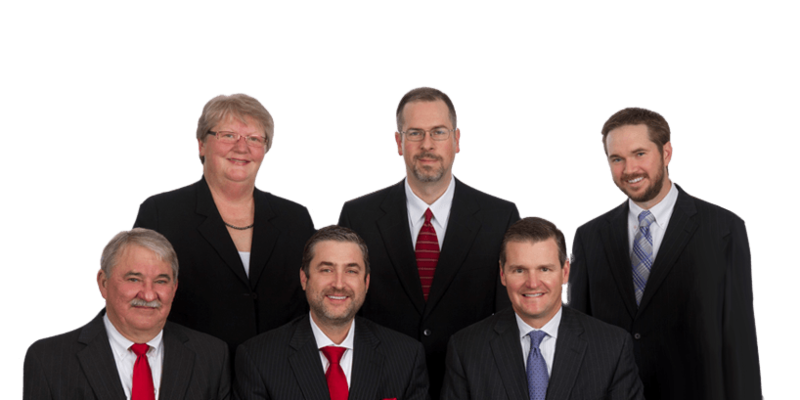 We welcome you to Langdon Davis, where you will receive high-quality, dedicated legal representation from our outstanding team of lawyers in the Texarkana area. We are committed to providing excellent legal representation in a wide variety of practice areas. We are honored to say that we have been included in the prestigious selection of Super Lawyers®, which is a peer review attorney rating service. Only 5 percent of attorneys from the state land on this list, which is a testament to the fact that we have been recognized by the legal community for our high level of ethical conduct and professional competence. Additionally, attorney Brent Langdon is a proud member of the Million Dollar Advocates Forum, the American Academy of Matrimonial Lawyers and a Board Certified Family Law Specialist by the National Board of Specialty Certification. Our skilled attorneys and litigators are on hand to assist you with your legal issue, whatever it may be. Our attorneys are proud members of numerous associations and professional organizations including the state courts of Texas and Arkansas, the United States District Courts for the Eastern District of Texas, the Eastern and Western District Courts of Arkansas, the United States Court of Appeals for the Eighth Circuit and the Fifth Circuit. The attorneys at our firm are seasoned litigators; Mr. Brent Langdon has over twenty five years of experience in litigation on behalf of individuals, families and businesses. Kyle Davis is recognized as a leader in real estate practice. Nick Newton is a CPA with a masters of Law in Taxation and is available for estate planning and accounting for individuals and business entities. Brent Langdon and his partner Kyle Davis, and their associates can be found representing our clients before a judge on most days of the week. Our attorneys know the Texas and Arkansas court systems inside and out, and we are well respected by local judges, prosecutors, and court personnel in both states. Contact us today or call (903) 223-3246 to find out how we can help you with your legal matter. Attorney Brent Langdon is a proud member of the American Academy of Matrimonial Lawyers, the Texarkana, Northeast Texas, Southwest Arkansas, and the Arkansas Bar Associations. He is also a member of the Multi-Million Dollar Advocates Forum, the Litigation and Family Law Sections of the State Bar of Texas and the Arkansas Bar Association. We are proud to serve the residents of Texarkana, New Boston, and the surrounding communities. Attorney Kyle Davis is a member of the Texarkana and Northeast Texas Bar Associations, the Texas Trial Lawyers Association, the State Bar of Texas – Real Estate and Probate Sections, and the American Bar Association. He is also a member of the Texas Association of Banker's Counsel and the Texas Land Title Association. If you need legal assistance in Texas or Arkansas, our attorneys are just a phone call away. We have offices in Texarkana and New Boston, to better serve our clients. Personal injury law is that area of law that deals with injuries to someone's body, their mind, or their emotions as opposed to injuries to property. Whether you were injured in an auto or trucking accident, a motorcycle accident, or if you were injured by a dangerous or defective product, our legal team is well-versed in handling all different types of negligence claims. Our Texarkana personal injury attorneys are extremely familiar with the state laws in both Texas and Arkansas as they pertain to civil torts and personal injury claims, and we are fully prepared to pursue maximum financial recovery on your behalf. Such recovery may cover damages for medical expenses, pain and suffering, property damage (auto accidents), lost income and loss of anticipated income. Hiring an aggressive attorney is critical if you want to have the greatest chances of obtaining maximum compensation. Are you considering filing for divorce? Family law matters have a reputation for being some of the most emotionally charged and volatile aspects of law. For this reason, whenever you need assistance drafting a prenuptial agreement, or getting a legal separation or a divorce, you should enlist the services of a good attorney. Our firm handles all aspects of family law including: prenuptial agreements, legal separations, divorce, child support, child custody, visitation, asset division, debt division and spousal support. We can also assist clients who need assistance with adoptions, child custody and child support modifications, as well as enforcement of court orders. If you are a victim of domestic violence or if you are being accused of domestic violence, we can also provide you with immediate assistance with these critical issues. Are you facing criminal charges in Texas or Arkansas? While facing criminal charges is a bad situation to be in for anyone, the situation only worsens if you are facing criminal charges in Texas. Texas is renowned for having one of the harshest criminal justice systems in the nation, and when law enforcement and state prosecutors have made their minds up about you, you need the most experienced and aggressive attorney you can find. Our attorneys are not only admitted to practice in Arkansas and Texas, we are also admitted to practice in both the state and federal courts of each of these states. We find this gives us a great deal of flexibility and it allows us to better accommodate our criminal defense clients. Whether you are facing charges for DWI, drug possession, burglary, battery, or embezzlement, our primary goal is to search for and unearth holes or weaknesses in the prosecution's case that can enable us to get your charges reduced, if not dropped entirely. Looking to plan for the future? You've worked hard your entire life to build a home, as well as an estate to live on and pass on to your heirs. However, building your retirement is only the first step, protecting your hard-earned assets is equally important. Our firm offers estate planning services to all of our clients who wish to plan for their future and pass on their assets to their loved ones. For those who need legal assistance with an estate matter, our legal team offers services including Medicaid planning, last wills and testaments, lifetime gifting, life estates, beneficiary designations, joint ownerships, and probate services. Protecting your estate and your loved ones from Medicaid Estate Recovery, probate and from certain tax implications is extremely important. With careful preparation and planning, we can help you get the most out of your estate, all the while minimizing the tax implications involved. Need ongoing legal support for your business? Incorporation is a critical aspect to creating a successful business and for protecting yourself from personal liability. Our firm is proficient at helping people create C-Corporations, S-Corporations and Limited Liability Corporations (LLC). We can clearly explain the advantages and disadvantages of each type of formation, that way you can select the most practical type of formation for you. By taking the mystery out of the corporate filing process, you can breathe easier knowing that we can explain all of your options and streamline the process for you as efficiently as possible. Do you already have a business but are involved in a business dispute? Unfortunately, commercial litigation is extremely common when you own a business or are involved with a corporation. We are honored to offer assistance to our business clients with a variety of business matters including but not limited to: commercial real estate transactions, business dissolution, interference with business relationships, construction litigation, breach of contract and much more. Need to protect your home or ownership rights? Our firm offers legal services for both residential and commercial real estate transactions. Whether you need us to go over the details of your real estate contract in order to look for any red flags or if you need us to ensure that you aren't buying a property with any potential problems, we can assist you in all of your real estate needs whether you are buying or selling residential or commercial property. Is your home facing foreclosure? As a result of the economy, countless individuals have been facing tough decisions regarding their home. Should you walk away from your mortgage, file Chapter 13 or try to negotiate with your lender? These are all important questions that we can help you find answers to. With the help of one of our knowledgeable attorneys, you can gain a clear sense of direction as to what your next best plan of action should be.